Which DAW is better than all the others? These the Top 10 most popular DAW. Digital audio workstation (DAW) is an electronic system designed solely or primarily for recording, editing and playing back digital audio. DAWs were originally tape-less. 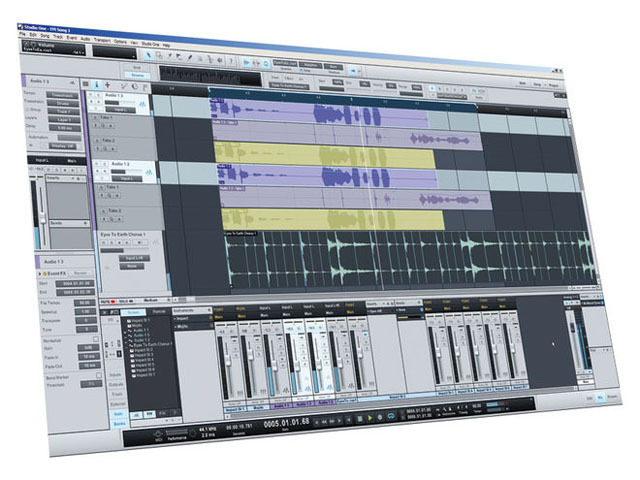 PreSonus Studio One music creation and production software gives you more than simply a powerful DAW. It is made to work seamlessly with your interfaces and controllers — especially PreSonus hardware. You get unlimited tracks within a very easy-to-use single-window interface, with drag-and-drop convenience. In addition to its 64-bit processing capability, Studio One offers great mastering tools and a collection of plug-ins for a start-to-finish "in the box" recording solution! Reason is a computer program for creating and editing music developed by Swedish software developers Propellerhead Software. It emulates a rack of hardware synthesizers, samplers, signal processors, sequencers, and mixers, all of which can be freely interconnected in an arbitrary manner. Reason can be used either as a complete virtual music studio or as a collection of virtual instruments to be used with other sequencing software in a fashion that mimics "live" performance. FL Studio (formerly known as FruityLoops) is a digital audio workstation developed by the Belgian company Image-Line. FL Studio features a graphical user interface based on a pattern-based music sequencer. The program is available in four different editions for Microsoft Windows, including FL Studio Express, Fruity Edition, Producer Edition, and the Signature Bundle. Image-Line offers lifetime free updates to the program, meaning customers receive all future updates of the software for free. Image-Line also develops FL Studio Mobile for the iPod Touch, iPhone, and iPad. Mixcraft is a multitrack recording application for Windows. The software functions as a Digital Audio Workstation (DAW), MIDI sequencer, virtual instrument host, non-linear video arranger, and as a music loop remix program. This is also commonly known as "Garageband for the PC". Logic Pro is a hybrid 32 / 64 bit digital audio workstation and MIDI sequencer software application for the Mac OS X platform. Originally created by German software developer Emagic, Logic Pro became an Apple product when Apple bought Emagic in 2002. Logic Pro is part of Apple's Logic Studio bundle of professional music applications. This is the "professional version" of Garageband" for the Mac. ACID Pro 7 is a full multitrack recording software with mixing, MIDI sequencing, and legendary ACID looping. It represents an incredible value for the PC-based studio. To start the creative process, you get over 3,000 loops and 1,000 MIDI files right out of the box - and that's in addition to a potent effects rack powered by iZotope and great-sounding virtual instruments, including Native Instruments' Guitar Combos software and Submersible Music's KitCore. What's more, control over MIDI data is better than it's ever been, as ACID Pro 7 sports real-time MIDI automation, quantization, and deep editing functionality. Plus, ACID Pro 7 boasts a new time-stretching feature. Cubase is a music software product developed by German musical software and equipment company Steinberg for music recording, arranging and editing as part of a Digital Audio Workstation. It is one of the oldest DAWs to still enjoy widespread use. Cubase 7 was released on December 5, 2012. New features include MixConsole, an improved workflow including full-screen capability, and redesigned channel strips and channel centrals. It also includes a new Chord Track and a Chord Assistant. Pro Tools is the "Gold Standard" digital audio workstation platform for Microsoft Windows and Mac OS X operating systems, developed and manufactured by Avid Technology. It is widely used by professionals throughout the audio industries for recording and editing in music production, film scoring, film and television post production, musical notation and MIDI sequencing. Pro Tools can run as standalone software, or operate using a range of external A/D converters and internal PCI or PCIe audio cards with onboard DSP. In 1999 Pro Tools made history: "Livin' la Vida Loca" was the first U.S. number one single to be recorded without using then-conventional recording studio equipment; instead the track was created in an entirely computerised environment using the Pro Tools software package. Since then countless of #1 hit songs were created with this software. Cakewalk SONAR is a digital audio workstation made by Cakewalk for recording, editing, mixing, mastering and outputting audio. It has recently been acquired by Roland. Ableton Live is a loop-based software music sequencer and DAW for OS X and Windows. The latest major release of Live, Version 8, was released in April 2009. In contrast to many other software sequencers, Live is designed to be an instrument for live performances as well as a tool for composing, recording, arranging, mixing and mastering. It is also used for beatmixing of tracks by DJs, as it offers a suite of controls for beatmatching, crossfading, and other effects used by turntablists, and was one of the first music applications to automatically beat match songs.